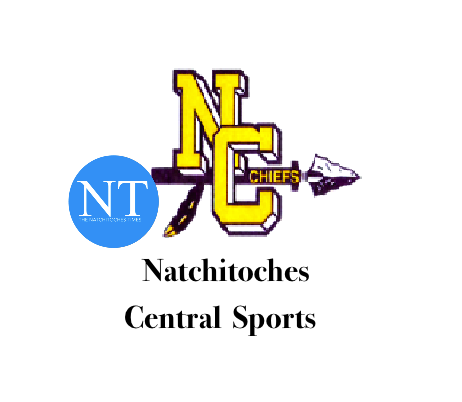 The Natchitoches Central High School track and field teams competed in the Airline Viking Relays at Airline High School March 8. NCHS put on an impressive performance against a competitive field with the boys team scoring 48 points, earning them fifth among 14 teams and the girls team scored 45 points placing them sixth among 12 teams. 100m dash: Heat 3: first place, Gallecia Bell, freshman, with a time of 14.21; Carrington Soloman, sophomore (SO), fifth place with a time of 14.95. 200m dash: Heat 1: Tym’mia Helaire, sophomore, eighth place with a time of 31.18. Heat 2: Camryn Scott, sophomore, sixth place with a time of 28.86. 1600m run: Katherine Anderson, freshman (F), sixth overall with a time of 6:46.54. 3200m run: Katherine Anderson, F, third place with a time of 14:42.72. 300m hurdles: Heat 1: Madison Brown, SO, first with a time of 49.21. 4x100m relay: Heat 1: NCHS, fourth place with a time of 51.65. 4x200m relay: Heat 1: NCHS, sixth place with a time of 1:53.40. Pole Vault: Madison Brown, SO, first place with a height of 10 feet even. Shot Put: Jazzare Burrell, JR, fifth place with a distance of 30 feet .25 inches; Heather Rathburn, SO, 17 feet, 6 inches. Discus: Jazzare Burrell, JR, fourth with a distance of 80 feet, 4 inches; Aaliyal Lacour, SO, 53 feet, 1 inch. Javelin: Haley Franks, SO, second, 97 feet, 2 inches; Megan Sarpy, ninth with 68 feet, 8 inches. 100m dash: Heat 2: Logan Davis, JR, sixth with a time of 11.65. Heat 3: Carlos Moses, SO, fifth with a time of 12.03. 200m dash: Heat 1: Jeremiah Aaron, SO, seventh with a time of 25.15; Heat 2: Carlos Moses, SO, eighth with a time of 25.71. 400m run: Heat 2: Trenton Bradley, FR, fourth with a time of 55.38. 800m run: Heat 1: Dwan Stuckey, JR, third, with a time of 2:06.52; Matthew Brown, SR, seventh with a time of 2:11.00. 1600m run: Cooper Miller, JR, first place with a time of 4:41.73; Hayden Churchman, eighth place with a time of 5:19.30. 3200m run: Matthew Brown, SR, third with a time of 11:00.5, Chris Waldrip, JR, fifth with a time of 11:40.7. 100m hurdles: Heat 4: Nathan Ellis, FR, fourth with a time of 19.25. 300m hurdles: Heat 2:Jordan Charles, JR, second with a time of 45.09; Heat 3: Anthony Moses, first with a time of 43.92. 4x100m relay: NCHS, sixth with a time of 44.80. 4x400m relay: Heat 1: NCHS, fourth with a time of 3:36.50. Pole Vault: Devin Pier, JR, fifth with a height of 9 feet even. Long Jump: Anthony Moses, FR, 10th place with a distance of 19 feet, .5 inches. ; Carlos Moses, SO, 18 feet, 9.75 inches. Triple Jump: Jaylon Braxton, FR, ninth with a distance of 38 feet, 9.25 inches. ; Robin Mathes, SO, 32 feet, 9 inches. Shot Put: Najee Helaire, SO, 32 feet, .5 inches; Derrick Williams, SO, 32 feet, .25 inches. Discus: Chancellor Davis, SO, with a distance of 90 feet, 4 inches; Kiren Latchie, SO, 84 feet, 9 inches. Javelin: Colt Deblieux, JR, third with a distance of 138 feet, 11 inches; Garrett Hood, JR, 91 feet, 7 inches.